I live right by the Union Square Farmer’s Market so I stop by at least once a week. Over the years, it has gotten pretty expensive, and even though most of the produce ( I don’t like most of the bread vendors) is worth it, I still don’t always buy it there because, I just can’t afford to all the time. Tomorrow is Mother’s Day and we’re having both our mom’s over. We decided the theme would be to highlight all the wonderfully fresh veggies in the farmer’s market, because both our moms love fresh veggies.It was fun to kind of go, no holds barred, and buy anything we wanted. 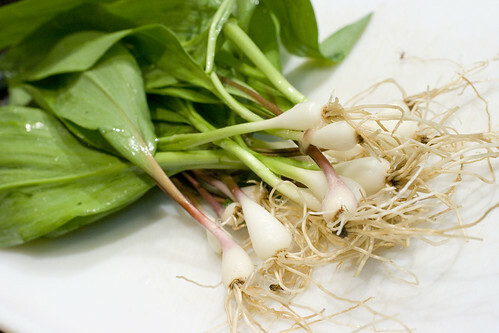 Ramps are all the craze right now because they have a very short season. Lots of vendors are selling for $3 a bunch, but we found one selling for $2.50. 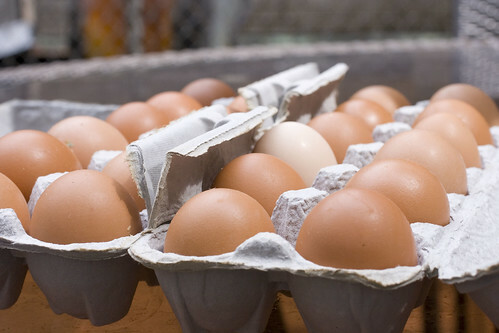 Knoll Krest Farm has small eggs on sale, 2 dozen for $5. Small eggs are inconvenient to bake with (because large is standard in baking) but if you’re making omelets or eggs for breakfast, small eggs are better. 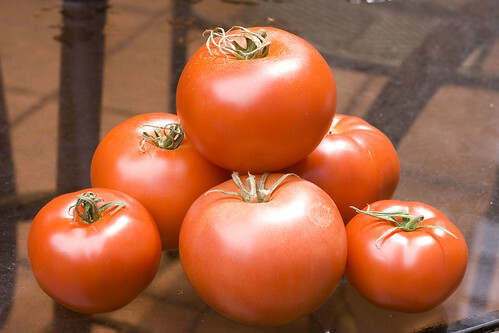 Organic Tomatoes are about $4.50 per pound these days. 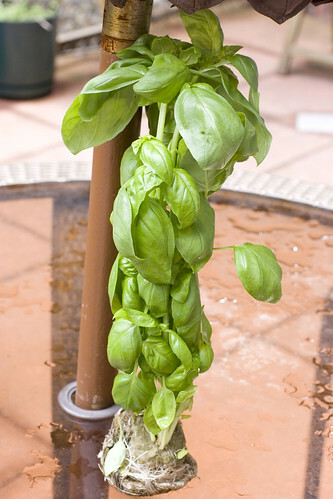 The same vendor was selling hydroponically grown basil for $3.75, which is pretty expensive but each leaf looked perfect and I couldn’t resist. My total here was $14. 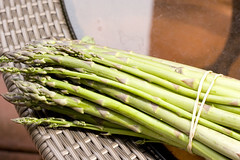 Two bunches of rhubarb and some great looking asparagus cost $9. 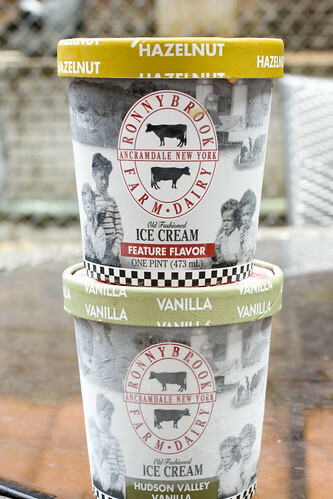 Ronybrook Farms Ice Cream $8 ($4 per pint). 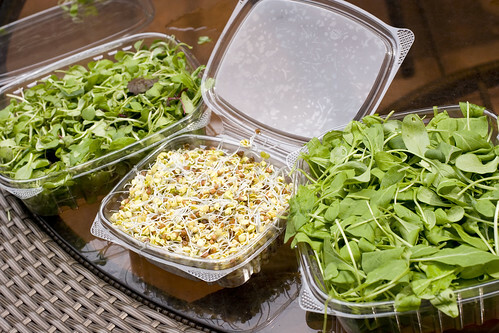 Micro greens, micro arugula, and radish sprouts $12. 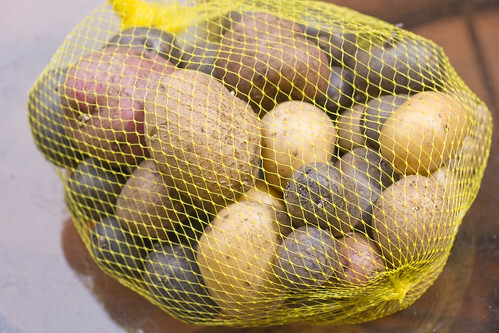 A bag of mixed potatoes $5. Grand Total $59.50 (and we don’t even have any meat yet). Happy Moms…priceless. posted by jessica	at 12:54 PM	Filed under Shopping. You can follow any responses to this entry through the RSS 2.0 feed. Both comments and pings are currently closed. 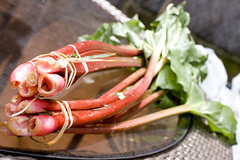 If it makes you feel any better, ramps here are $20/lb! But all your produce looks like it’s great quality. I sauteed some fresh ramps last week in butter with salt/pepper. 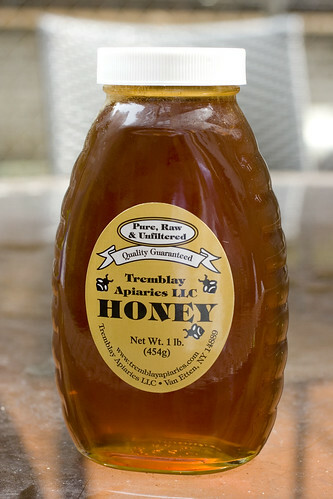 Put it over fresh wheat bread. Heaven. I would love some more uses for ramps. I’ll bet they would be AWESOME in mashed potatoes. i went looking for ramps at our farmer’s market here, but no luck. can’t wait to see what you guys do with them. we had seared escolar with ramp puree and porchetta di testa with pickled ramps on toasted bread at our favorite restaurant at niche, both of which were really ways of using ramps.